of the court house in which the aforementioned girl has recently taken to suing the amusement park. One leg was confiscated from a confused foreign couple, who seemed to be under the impression it was "Free Souvenir Day" at the park on the day of the incident. The other was found in the RV of a highly redneck family from the heart of Kentucky. It is believed that the rednecks found the leg and were taking it home for dinner (admittedly, the rednecks could also be described as "confused," but...well, they're rednecks). Both legs were taken and given to a team of doctors who seemed baffled concerning the peculiar fate of the legs. However, it was too late for the legs to be reattached to their original owner, since as you may know, detached human body parts don't keep for very long before taking on a very unpleasant odor. Instead, they were taken back by Park officials, who had formulated a better idea. The Court recently ruled in Favor of Six Flags and dismissed the case. Judge Jackson Daniels ruling castigated the Plaintiff's attorney and reiterated that "The Plaintiff didn't have a leg to stand on." Acknowledging the Court's findings, Six Flags today reopened the ride, which had been avoided like the plague since the time of the incident, with a new marketing strategy in mind. 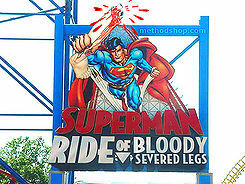 Newly renamed, the Superman Ride of Severed Legs has become an instant hit with park-goers. Thrill-seekers, stupid college students, and even typical American families, complete with small children, now make the daily ride to Six Flags in anticipation of the ride's newest feature: Three times a day, the previously condemned ride severs the legs of its riders, in an astonishingly realistic reenaction of the events leading up to its closure in late June. The new and improved sense of risk has people flocking to the ride. When one of the doomed carts reaches the top, a swift snap of a cable amputates the legs of all the riders. As another benefit to the ride, the new amputees get a complimentary helicopter ride to the hospital, provided of course, that their insurance covers it. After the legs fall from the sky, park officials haul them away in containers, moving them to a holding area near the gift shop. Park officials got the idea that the legs, having become such a staple of the park's identity, would make good souvenirs. Each set is being sold at an outrageous two-hundred and three dollars. With prices so high, these pedal peculiarities have officially become collectors items in several books that are alleged authorities on the matter, and have even reached "delicacy" status in the infamous book, Redneck Cooking for Dummies. Sources say that some necrophiliacs have even been seen stealing legs from the shop, as part of some sort of sick, twisted, dead leg fetish they must have. The ride's style of amputation has also been recognized by travelers from the middle east as a great simulation of stepping on a land mine in your own front yard. As the rides popularity continues to sky rocket, more and more awesome and crude uses for the legs will flourish. With all these uses for legs, the Six Flags corporation has surpassed Microsoft as the highest grossing corporation in the world. Ride engineers have been forced to build a copy of the ride in every one of the Six Flags parks. With further growth in these gruesome yet awesome rides, Six Flags is "bringing the thrill of leg amputation directly to its guests, and right to the dinner table of all those hungry rednecks." ↑ Six Flags is expected to start insuring riders at the gift shop at the ride's exit, prior to each daily amputation. ↑ And likewise, dinner for some cannibalistic rednecks. ↑ Well, obviously. Who else do you think is going to read it? This page was last edited on 5 June 2012, at 07:01.